Amarinth API 610 OH2 pumps ready for shipment to the Coral South Development Project, Mozambique. Amarinth has secured two orders, together worth US$750 000, to supply API 610 OH2 pumps with Plan 53B support systems for Mozambique’s Coral South Development Project. 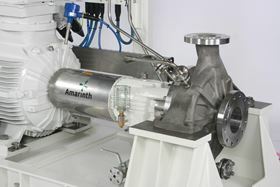 The two orders were both secured through Amarinth’s Malaysian sales office. The first order, which was required on a 28-week delivery, was for an API 610 OH2 pump with Plan 53B seal support system for installation on a de-sanding package. This was quickly followed by a larger order for eight API 610 OH2 bespoke pumps with Plan 53B support systems. The bespoke design requirement for these pumps was for a 600lb flange rating on the discharge and suction nozzles, double the normal API 610 loading. These pumps will be used in hazardous areas and so had to be fully IEC/EX compliant on all electrical items and, like the first pump, were also required on a tight 28-week deadline.